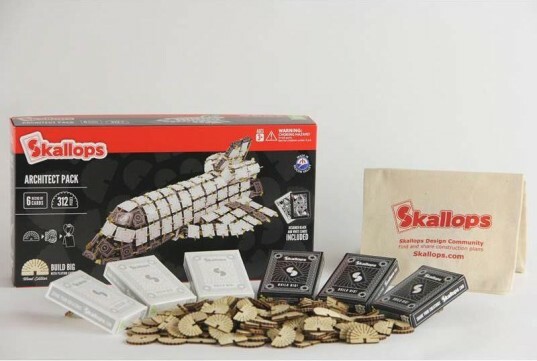 Skallops is a new toy comprised of unique building clips and playing cards. Skallops started off as a Kickstarter project that people went wild for. The toy easily got enough backers, going well beyond their Kickstarter goal -- and now they're available for everyone to enjoy. 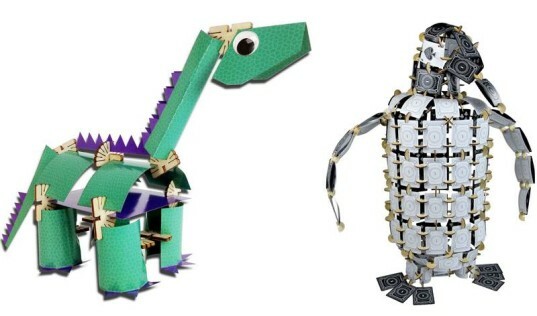 They're the perfect alternative to plastic LEGO bricks for a kid who loves to build. Keep reading to learn more about this simple but incredibly fun creativity tool from the mind of a Cal Tech alumni. 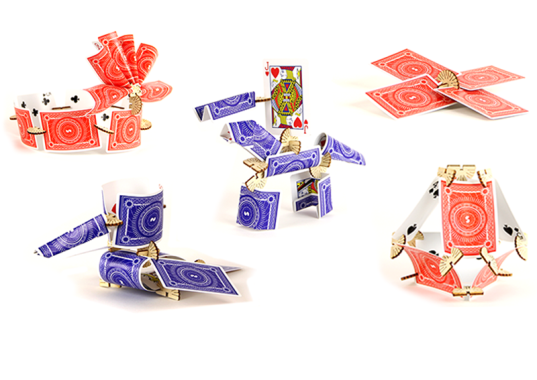 Skallops are cool laser-cut clips that attach to regular playing cards in many dozens of ways, so your child (or you) can build anything that you can imagine. As you can see above, Skallops can be used to create amazing structures that will impress kids and ignite their imagination. 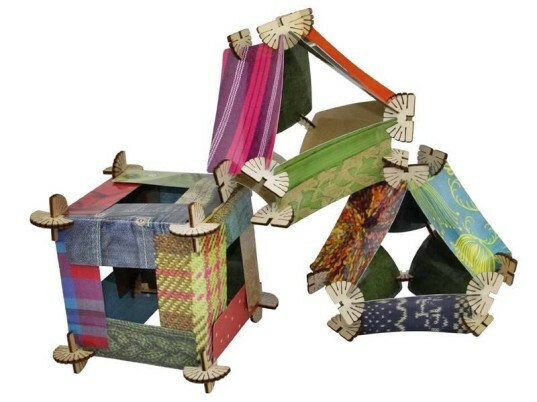 Kids can create structures using pre-made kits or dream up their own designs. 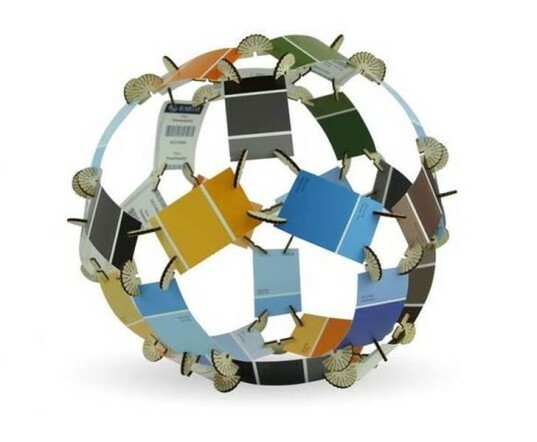 Because of their smart design, Skallops can be used to fashion mobile structures that bend, roll and otherwise move, offering a nice alternative to most typically square and rectangle block structures. 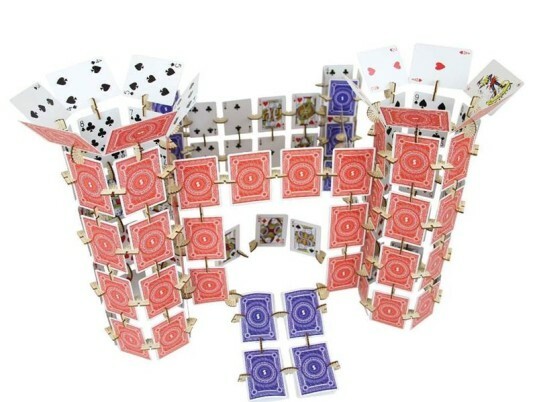 Adding more clips and cards means your child can build HUGE structures that are fun to create and play with. Skallops come in many different sets. From smaller starter sets to an ultimate architect set and other sets in-between. 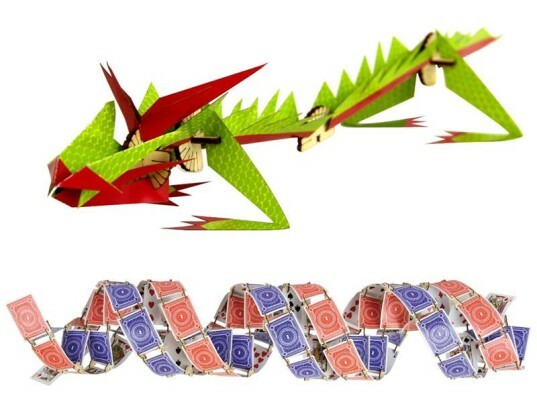 Plus, there are special sets that offer preconceived structures, such as a dino, bird or airplane. 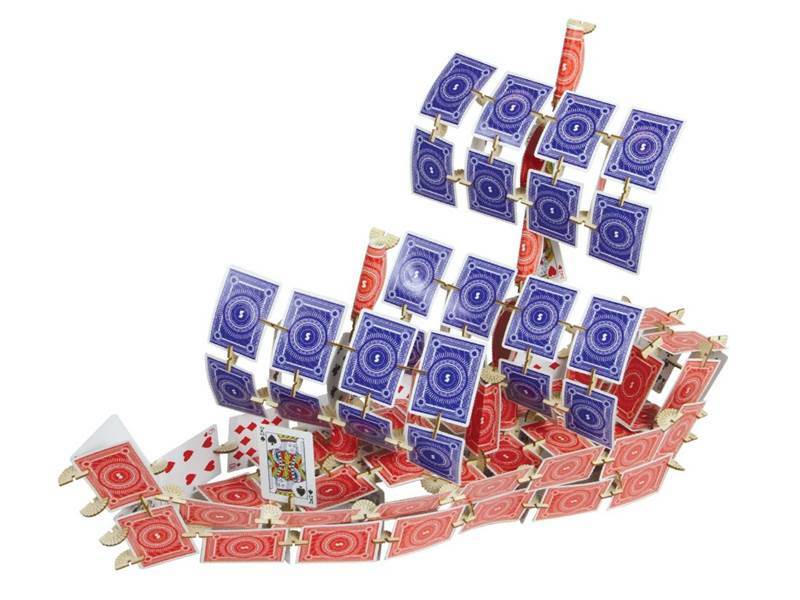 Almost all the sets come with a deck of playing cards as well as Skallops. Skallops are laser cut out of high-quality, sanded and finished birch plywood.They’re non-toxic and safe enough to chew on – though we can’t recommend them as a healthy snack (too much fiber)! 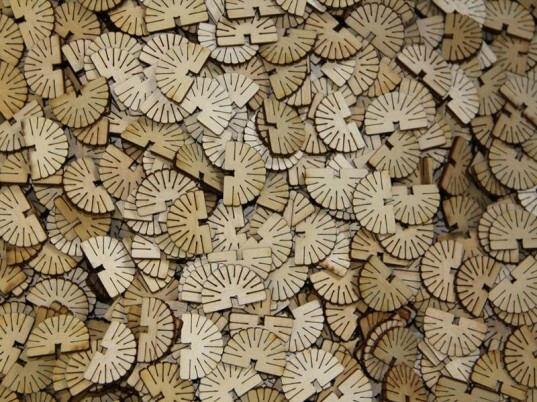 The plywood used to make Skallops is sanded, finished, laser cut, and packaged in California. 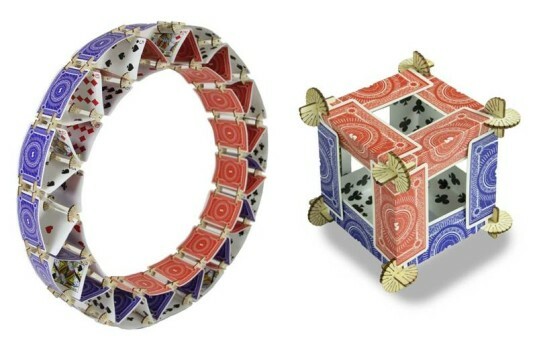 The company also uses Bicycle brand cards from the USA-based Playing Card Company. Plus, if you want to buy Skallops locally vs. online, you have many options. 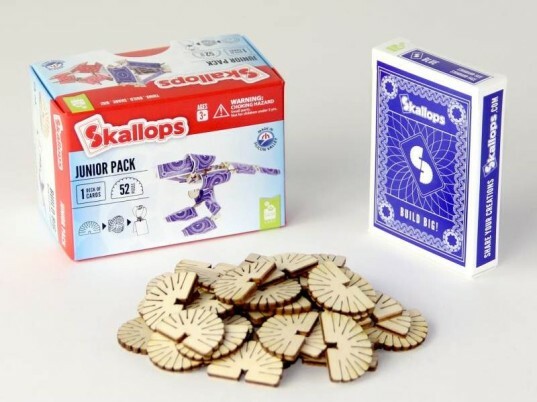 Not all Skallops sets come with plain playing cards. The Fabric Collection is an awesome set that comes with a pack of limited-edition custom-printed playing cards featuring photos of vintage clothing. Perfect for kids who like building and cool textures. There’s a nice Simply Skallops set that enables anyone to use found or recycled objects to build huge, cool structures. 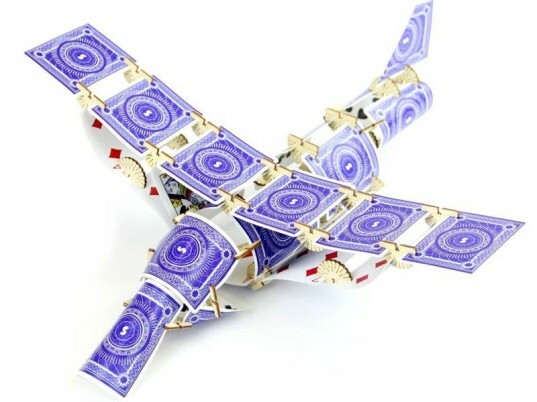 You can add your own breed of playing cards, use paint chip cards or even photos of the family to build killer structures that are uniquely you. Skallops offers a neat teacher’s area on their website that shows how Skallops can be used in schools. There are even challenges posted that teachers can assign to the kiddos. Skallops are assembled locally by a community organization that supports adults with disabilities and a local county worker support organization. Skallops are extremely affordable with sets ranging from $10.00 to massive sets for $99.00. There are many sets priced in-between too. Really any green family can find a set that will fit with their budget, and low-prices mean you can add on more sets as your child wants to build larger structures. 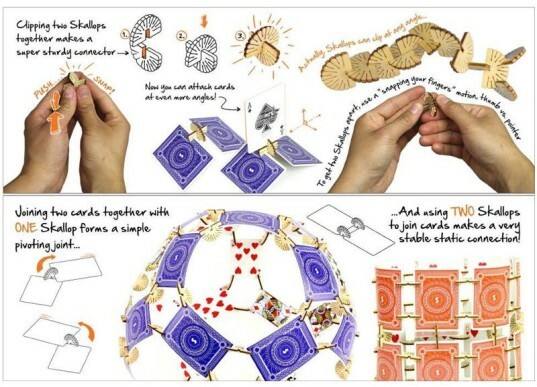 Skallops come with a very handy instruction booklet that teaches kids (and adults) how to use this creativity tool step-by-easy-step. The guide will have anyone building in no time flat. Skallops are laser cut out of high-quality, sanded and finished birch plywood. They're non-toxic and safe enough to chew on - though we can't recommend them as a healthy snack (too much fiber)! There's a nice Simply Skallops set that enables anyone to use found or recycled objects to build huge, cool structures. 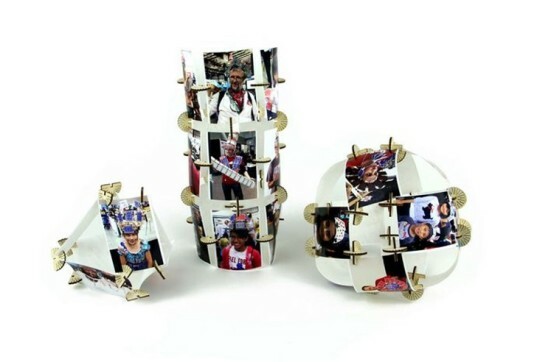 You can add your own breed of playing cards, use paint chip cards or even photos of the family to build killer structures that are uniquely you. Skallops offers a neat teacher's area on their website that shows how Skallops can be used in schools. There are even challenges posted that teachers can assign to the kiddos.